Where Is The Best Place To See The Cherry Blossoms In Tokyo? Here is my list of the best spots in Tokyo for cherry blossoms. I’ve also included a list of tips for enjoying hanami (cherry blossom viewing). At the northwest edge of the Imperial Palace, the Chidori-ga-fuchi moat is lined with thousands of cherry blossoms. You can admire them from walkways beside the moat, or you can rent rowboats to enjoy them from below. In the evening, the trees are illuminated and the effect is magical. The closest stations are Ichigaya, Kudanshita and Kojimachi. 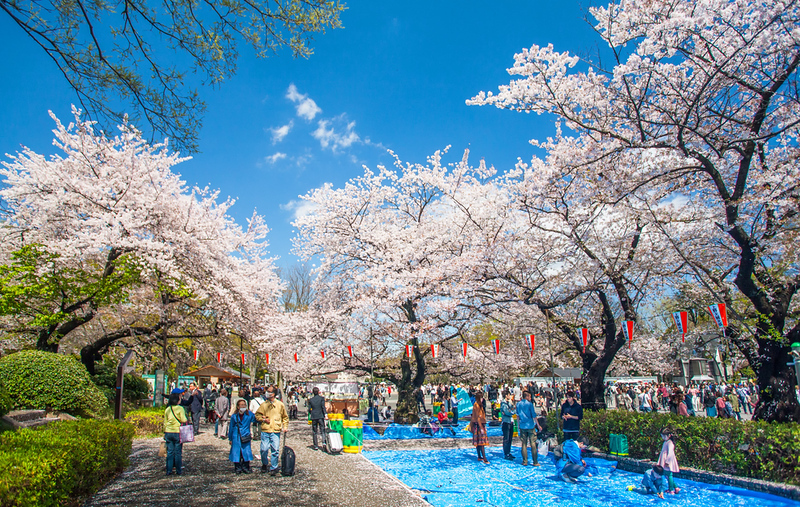 Tokyo’s most famous and popular cherry blossom viewing spot is Ueno-koen Park. 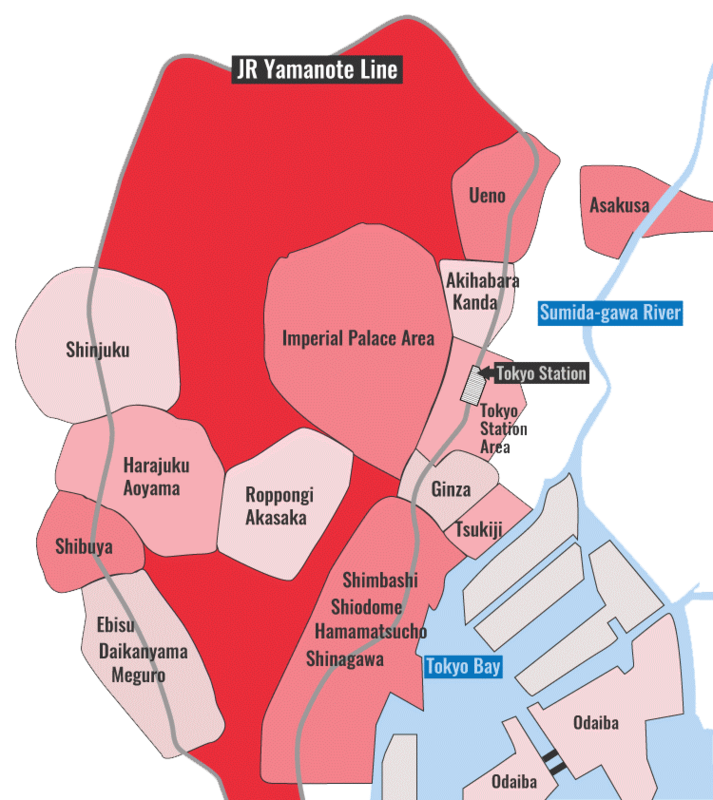 This is where the wildest hanami (flower viewing parties) are held. It can get pretty raucous here and there’s plenty of public drunkenness, particularly in the evenings. So, you might want to go elsewhere, especially if traveling with children. Just east of Asakusa, both banks of the Sumida-gawa River are part of a park called Sumida-gawa-koen Park. This park is filled with cherry trees, which are illuminated in the evenings to create a beautiful scene. This is a little more laid back than Ueno-koen Park and it’s good both night and day. For a relaxing daytime hanami, I recommend Shinjuku Gyoen, which is more spacious and far less wild than Ueno-koen Park. With three different garden styles, this is a lovely spot to enjoy the cherries. A short walk west of Harajuku Station on the Yamanote Line, this sprawling park is another relaxing place to enjoy the cherry blossoms and it can easily be combined with a trip to Meiji-jingu Shrine. The Meguro-gawa River, just a short walk east of Nakameguro Station on the Tokyu Toyoko line, is lined with beautiful cherry trees that are illuminated in the evening. It’s the scene of some raucous partying. Because the “river” here is more of a concrete canal, this is not as scenic as some other spots in Tokyo but it’s a lot of fun. Dress warmly: It can still be pretty cool during cherry blossom season, especially in the evening. Cherry blossom spots can be very long. Department stores sell great bentos for hanami parties. Use bathrooms when you can: Lines for public bathrooms can be very long at popular spots, especially for ladies. When you see a place without a line, use it! Go early: If you don’t like crowds, visit these cherry blossom spots in the morning! Bring a garbage bag: If you’re going to have a party or a picnic, bring a garbage bag, because there aren’t many bins in Tokyo. Where Is The Best Place To See Cherry Blossoms In Tokyo?